From the beginning, rock act Muddy Apes set a lofty goal for themselves. Other groups have formed with similar ambitions. But unlike most bands, Muddy Apes are achieving their goal quickly. Having played only a handful of gigs to date, they’ll appear on Fuji Rock’s Red Marquee stage on July 28. Their inclusion at the event can be attributed mainly to their membership. 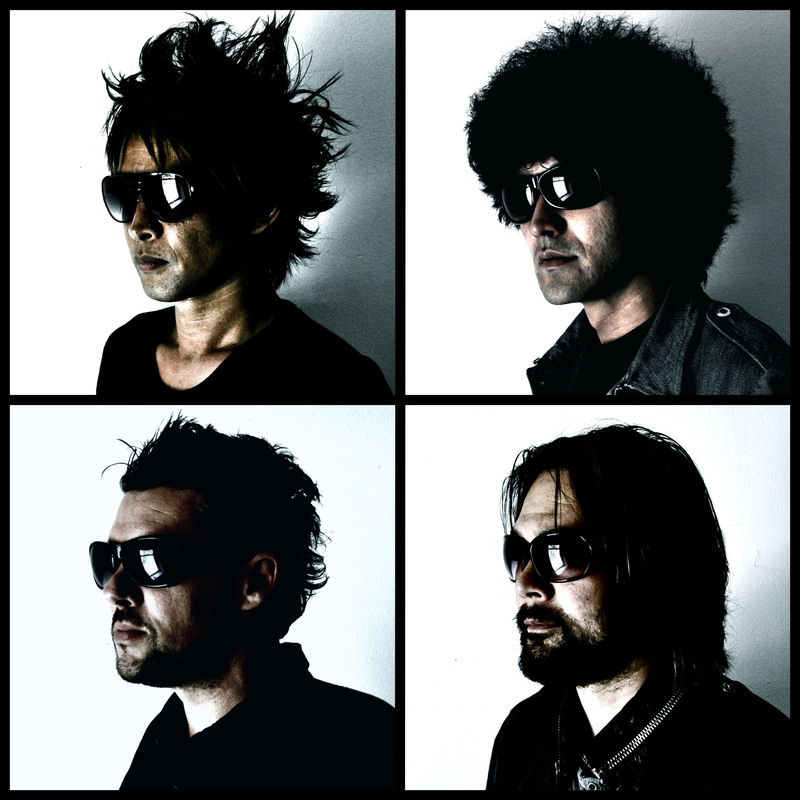 While technically a new act, Muddy Apes features Hirose from the popular British alt-rock group Feeder, guitarist Inoran (whose real name is Kiyonobu Inoue, but officially goes by his one-word moniker) from the popular visual-kei band Luna Sea, former Feeder touring guitarist Dean Tidey and vocalist Masaki “Maeson” Maenosono from Osaka garage-rock/post-punk act 8otto (the “8” is silent). Needing additional players, Hirose contacted Tidey and Maeson. Tidey had moved from Britain to Tampa, Florida, and according to Hirose was “a bit bored over there.” Hirose knew Maeson through mutual pals who spoke highly of his vocals. While Maeson handles singing and drumming in 8otto, Muddy Apes wanted him to focus solely on being a frontman. Since they were in different countries, Hirose, Inoran and Tidey exchanged music files digitally. As songs were pieced together, they were sent to Maeson to add vocals to. Last year the group gathered in Tampa to make Muddy Apes’ debut disc, “Crush It.” The recording sessions were actually the first time that Maeson and Tidey met. “Crush It” was released in September 2012 and Muddy Apes played three Japan shows that month to promote it. They regrouped for another Tokyo concert in late December. That was when they asked their label about being a part of this year’s Fuji Rock Festival. Working again through email, Hirose, Inoran and Tidey quickly created tracks for Muddy Apes’ “Fairy Dirt No. 5” sophomore effort. The act returned to Tampa this past spring for three weeks to record the album. It was released July 3. Solid from start to end, “Fairy Dirt No. 5” is filled with catchy, radio-friendly rock ‘n’ roll. “Kizuna Drive” is a slice of punchy post-punk that has Maeson spitting out fast-paced, almost spoken vocals. He cheekily counts “2, 5, 4, 3, 5, 5, 5” as the lead in to the fuzzed-out anthem “Generation 555.” And the uplifting alternative-rock cut “Peep Show” is certain to get the Fuji Rock masses bopping around. Muddy Apes will play a handful of Japan dates this summer in support of “Fairy Dirt No. 5,” with the most notable being Fuji Rock. For their upcoming concerts, Miyoko Yamaguchi from Tokyo garage rockers Detroit7 will drum for the band, upping their supergroup status even higher. So what can festival-goers expect from Muddy Apes’ performance at Fuji Rock this weekend? Muddy Apes play the Fuji Rock Festival’s Red Marquee at Naeba Ski Resort, Niigata Prefecture on July 28 (ticket prices vary); Aug. 1 at Shinjuku Loft in Tokyo (7 p.m.; ¥3,000 in advance; 03-5272-0382); Aug. 25 at Mihama Crystal Beach Sound at Suishohama Beach, Fukui Prefecture (ticket prices vary); Aug. 27 at Umeda Shangri-La in Osaka (7 p.m. ; ¥4,000 in advance; 06-6343-8601); Aug. 29 at Daikanyama Unit in Tokyo (7 p.m.; ¥3,800 in advance; 03-5459-8630). For more information, visit www.facebook.com/MuddyApes.